Knowing which plants are related to whom is very important if you are interested in producing seed that is genetically similar to the parent plants. Did you know that Broccoli and European Kale will cross with each other but Broccoli won’t cross with Siberian kale? That’s because Broccoli and European kale have the same genus and species – Brassica oleracea and Siberian kale is the same genus but a different species – Brassica napus. If two plants have the same genus and species as another plant, they can cross if planted too closely together. See the Plant families handout to learn more about which plants are related. If you want to save seed from two related crops that tend to cross, consider isolating them from each other to prevent unwanted cross pollination. Isolation can be achieved by using screened cages or by planting the two crops at different times or by separating them by distance. Population size is also important when you save seed from year to year. Plants like lettuce, beans and peas that are self pollinated only need a relatively small population from which to save seed. Squashes, corn and members of the brassica family that are cross pollinated need larger populations to prevent the plants from exhibiting inbreeding depression. Make sure to plant as many individuals as you can given the way the crop is pollinated. When the plants mature, they start to produce flowers. Only after a plant has flowered can seeds start to form. 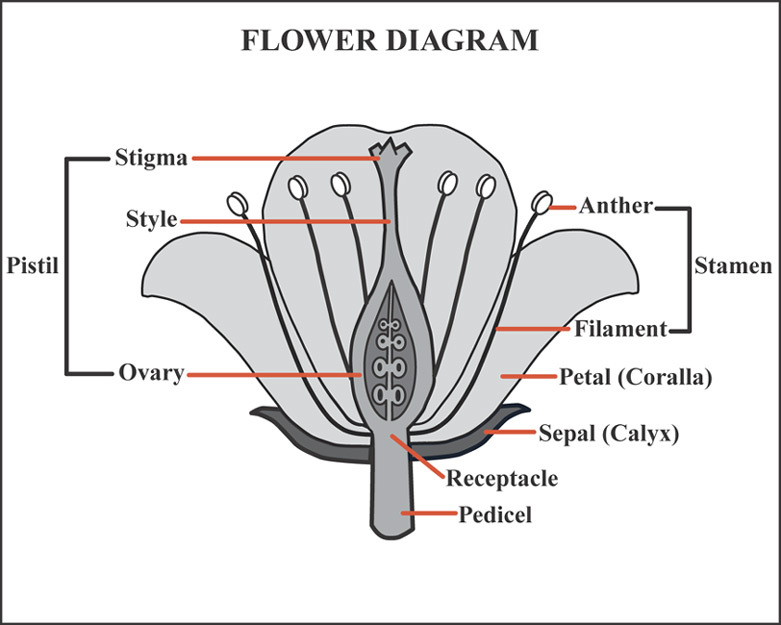 Seeds form in the ovary of the flower which is normally surrounded by the sepals and petals. Depending on the crop, pollinators can be essential to the process of creating seed. According to Craig Dremann of the Redwood City Seed Company, seed production improves as the number of pollinators increase. Major Pollinators for Vegetables. Crops like lettuce, tomatoes, beans, and peas are self pollinated which means they don’t need the help of insects or wind to move pollen from the anthers to the stigma, a step which ultimately starts the formation of seed. For successful seed formation, the anthers, or male parts of flowers, must produce healthy pollen and the pollen must germinate and reproduce once it reaches the ovules, the female parts of flowers. In tomatoes, the stigma is only receptive for 2-3 days. If weather extremes occur during this period, you will either not get fruit or you will get blossom drop. Most other crops, including squashes, cucumbers, and members of the Brassica family, all need pollinators’ help to move the pollen. 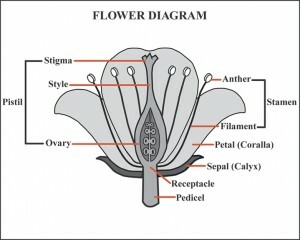 Once the pollen is moved, a pollen tube forms and the pollen travels down to reach the ovules inside the ovary. This is a very important step and can often mean the difference between good seed set or not. The process normally takes 24 hours to complete. If pollination occurs when the night temperatures are really cold, the pollen can die. Drought and heat also can determine how well or how poorly the pollen moves down the tube. Successful pollination usually results in viable seed. The seeds need to grow and mature on the mother plant until the plants have turned from green to brown. And even though gardeners are loathe to leave a less than beautiful plant in the garden, it is essential for the full development of the seed. Seeds are found on the plants where flowers used to be. When these plant parts mature, you will observe that they change from green to brown. This indicates that the seeds are maturing and drying. The longer you can leave the seeds on the plant without them dropping and dispersing, the better. As the seeds get ready to “shatter”, it is best to make daily observations, so that they can be collected at the peak of maturity. An easy way to collect seed from plants that send up stalks, such as lettuce, carrots and parsley, is to gently bend the stalk into a paper bag and shake the ripe seed off. Lettuce seed in particular matures over time, so it is necessary to repeat this process at least once a week until all the seed is captured. Label a bag or whatever container you choose with the variety name and the date you harvested. Some seeds benefit from additional drying once they are off the mother plant. Leave the seeds to dry in a dark, dry location with good air circulation. Seeds that form in pods, like green beans and peas should be collected in the pod. The pods should be brown and dry to the touch or when the pods almost pop open in your hand. Often you can hear the seeds rattle a bit inside the pods when they are ready. Place the pods in a paper bag and label the bag. Seeds from tomatoes, peppers, melons, cucumbers, pumpkins and squash are located in the flesh of the fruit. Collect the fruit when it is ripe or slightly over ripe. Melon, cucumber, pumpkins and squash seed all benefit for extra time to mature before removing from the fruit. For more on what to do next with these seeds, read on. Seeds that have been collected in the field that are already dry need only be separated from the chaff and other dry plant parts. If the chaff is light, it can either be picked out by hand or blown off with a hair dryer or fan on a low speed. Seeds that are located in the flesh of a fruit need to be separated from the fruit. Cut the fruit open and scoop out the seeds onto a plate. Wash off any flesh that remains, spread them out on cookie sheets or some flat surface that will prevent sticking and let the seeds dry. This may take up to a week indoors. Tomato seeds are mature when the tomato is ripe. A tomato is considered ripe when the green stem at the top of the fruit is 1/4 to 1/2 brown. Tomato seeds require special treatment and need to go through a fermentation process. Saving Tomato Seeds. All seed needs to be completely fry before storage other wise mold and mildew can develop. Once the seeds are processed, cleaned and completely dry, they can be stored. To store seeds, place them in paper envelopes. Mark the name of the variety and the date you collected them. Mark whether they are from your garden or from a friend or neighbor. Then place the envelopes in a glass jar, preferably with a rubber seal in the lid. This prevents the movement of air between the surrounding air and that of the air in the jar. If you are saving your seed for next year’s garden, you can place the jar in a cool dry location in your home. The best location is where the temperature added to the percent of relative humidity equals 100 or less. If you don’t have a location that meets these temperature and humidity numbers, then the seeds should be stored in the tightly sealed jar in the refrigerator or freezer. If you use the refrigerator or freezer, keeping moisture out is absolutely critical, so make sure your lid is sealed with a rubber gasket. If the jar isn’t sealed well, the seeds will absorb ambient moisture. The more moisture in the seed, the more the seed metabolizes. The more it metabolizes, the more energy and nutrients it uses while in storage, thus reducing its viability over time. Keeping seeds dry and cool increases the number of years the seed can be stored and then successfully germinated. When you are ready to use your seed for a new planting, remove jars from the refrigerator or freezer and let them come to room temperature before opening. This prevents condensation from forming in the jar and adding moisture where it shouldn’t be. Plant your seeds and start the cycle all over again.